In early January, I heard that I was going to be an Island Batik Ambassador for 2018. 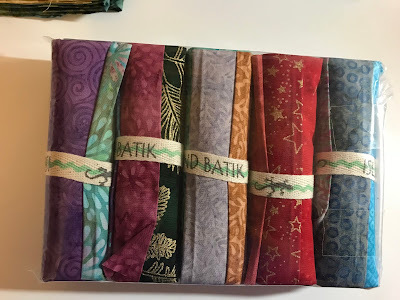 The neatest thing about this gig happens 2 times in 2018 – a huge box of Island Batik Fabrics and some items from their affiliates, Aurifil and Hobbs Batting. 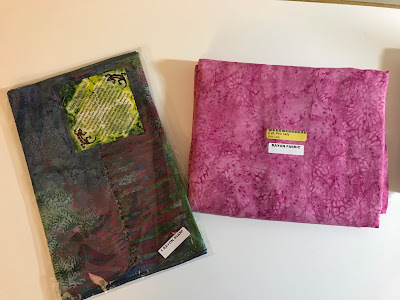 All the items that are featured in this post, were given to me by Island Batik and their affiliates – Hobbs and Aurifil. Ok – this is a “pre-production bundle” you can’t see until it is released to the public. Nor can I use it until then either. 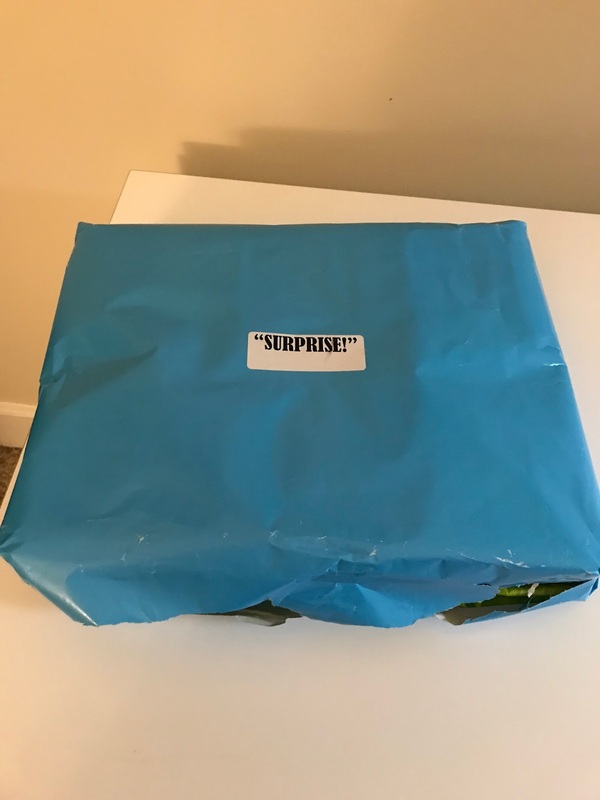 Funny, it was so excited to show me what colors were in there, that it busted out of its wrapping en route to me. 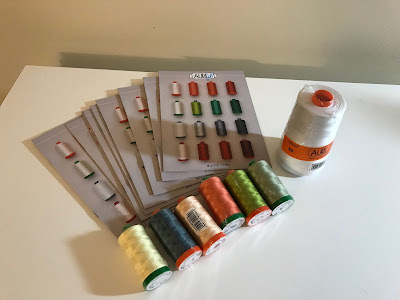 I love Aurifil thread and this grouping is terrific. That spool of white will easily get whittled down as the year goes on! The 50 wt threads are the ones with the orange spool – used for piecing or quilting. The green ones, are 40 wt – used mostly for machine quilting or embroidery where you want the stitches to go. They really go with some of the fabrics in the bundle. Also included were some catalogs which further explain their lines of thread and their uses. Let me know if you’d like one, happy to share the wealth! The next couple of items are from Hobbs – a company that makes a whole lot of batting. 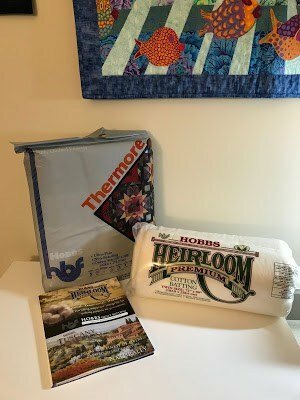 I have used the thermore for a quilt and will post something about that when I use it. 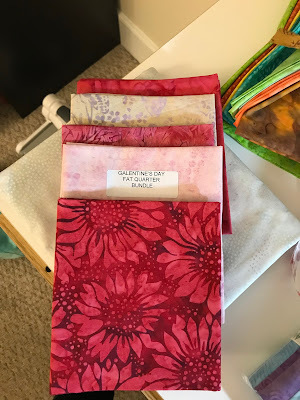 It is helpful in projects where you want less bulk – clothing, folded quilting, etc. You’ll see what I mean soon! I am anxious to use the Cotton blend (80 cotton/20 poly) as it has been some time since I have used this brand of batting. This is a lot of fabric! 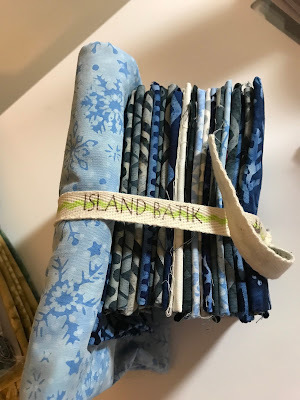 I’ll go through most of them individually but wanted to point out the gorgeous 3 yards of Rice – a great neutral that will make many appearances in later blogs/quilts. This will be the first group put to work. It is for Galentine’s Day – February 13th (more about what this means on Tuesday). In fact, as soon as I finish this blog, that is what I am doing – making a mug rug for a girlfriend! Two lights, two mediums and two darks – should be able to do something fun! These 5″ WOF strips (width of fabric +/- 44 inches) are called stash builders and have a variety of sympathetic fabrics in a roll and are great for filling in! The Alpine Ice collection is a great set of winter blues and creams and greys. Can’t wait to get into this bundle of fat eighths – it really is one of my favorite colorways. It also has 1.5 yards of a coordinating fabric to help you along. 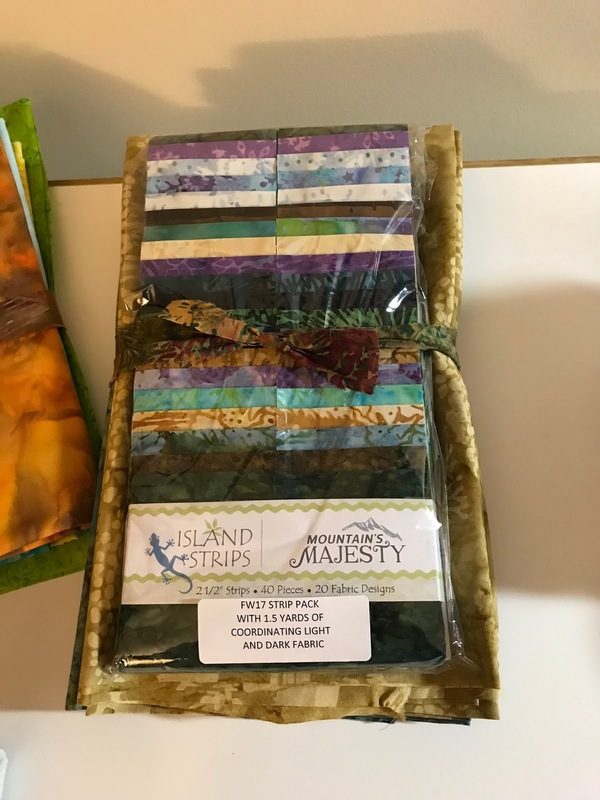 This group – Mountain’s Majesty is out of this world with so many luscious greens, purples, and creams!It has a jelly roll strip set along with a 1.5 yards each of light and dark coordinating fabrics. I have a plan, so if this fits, it would be one stellar quilt. And RAYON fabric – what fun. There is 2 yards of the pink fabric and the other package is a rayon scarf. Maybe a pink blouse is in my future or who knows? I wore the scarf to church this morning and have it on as I am writing this blog. It is a beauty! The foundations bundle is a group of some of the basic blenders and other fabrics that Island Batik produces. Like the stash builders, they will help fill in the blanks. Finally, a picture of the entire group all together. 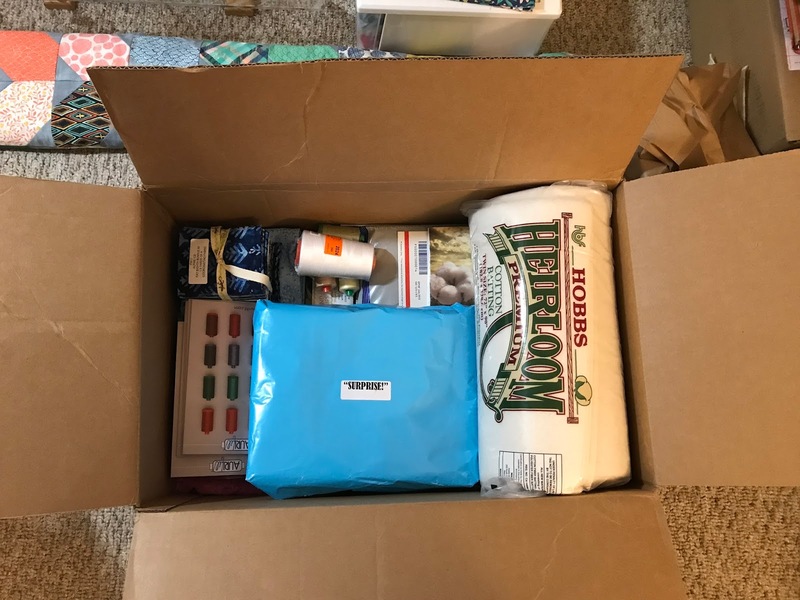 It was funny, I reboxed it this morning as I was leaving for our “reverse weekend” to Maine and every time I turned around I found another bundle. Don’t worry, my Galentine’s fabric and a few others are on the trip and will get converted into a swell project tomorrow!! The philosophy of Island Batik has always been to ensure the success, enrichment and development of the community to which it belongs. This is accomplished is by offering computer skills training, donating to neighborhood functions and village ceremonies as well as sponsoring the Island Batik community volleyball team. These efforts result in a constant uplifting of the people who partner with Island Batik in production. Because of the large group of artisans and workers employment many people have been able to buy land build new homes, send children to school and college as well as improve the community environment for the benefit of all. Please visit their website and find out more about them and their wonderful fabrics. Sewing time this week: Monday, Tuesday and Thursday. Wish me luck and if all goes well, you will see something on Tuesday!!! Previous Post OMG for February and other activities! Next Post Galentine’s Day is February 13th! Great box of goodies! 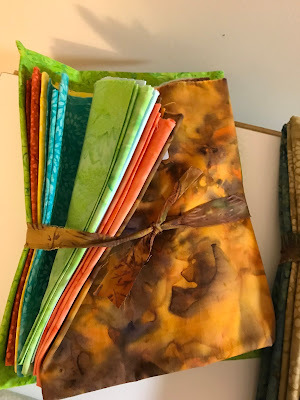 Can't wait to see what beautiful quilt projects you create this year! Thanks, Connie! Looking forward to yours too! Aren't the boxes divine?! So much potential, makes me tingle! Can't wait to see what you do for Tuesday! I know – that jealousy bug and hit when looking at the colors you love that someone else received. I am hoping that what it does is stretch my skills rather than stunt them! 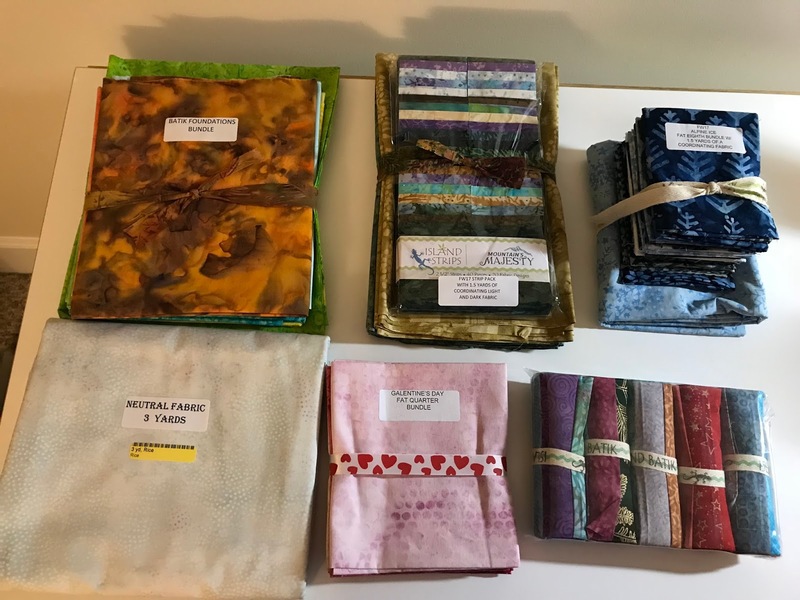 When I worked in the quilt store, I loved helping people who had different palettes or tastes than I do, as it does force you to look at things differently. I hope you enjoy working with the contents of your box! Thanks, Yvonne, for being so faithful and supportive in your comments. I must get started on my first project! It's been really fun to see what each IB Ambassador I know has received in her box. So many beautiful colors, and I'm thread jealous, seriously. I'm looking forward to seeing what you create! Thanks, Wendy. It really is fun to see it all, and imagine all the possibilities! Off I go to start on project #1 which I should be posting tomorrow. Looking forward to seeing the future projects. Thank you! It has been fun to dig into it and get going on the projects. Too much fun!!! Looking forward to seeing these quilts take shape! Thanks, Nancy, me too – a little scared by it all but I am sure I will get right into the flow! Wow, that's a lot of quilty goodness! 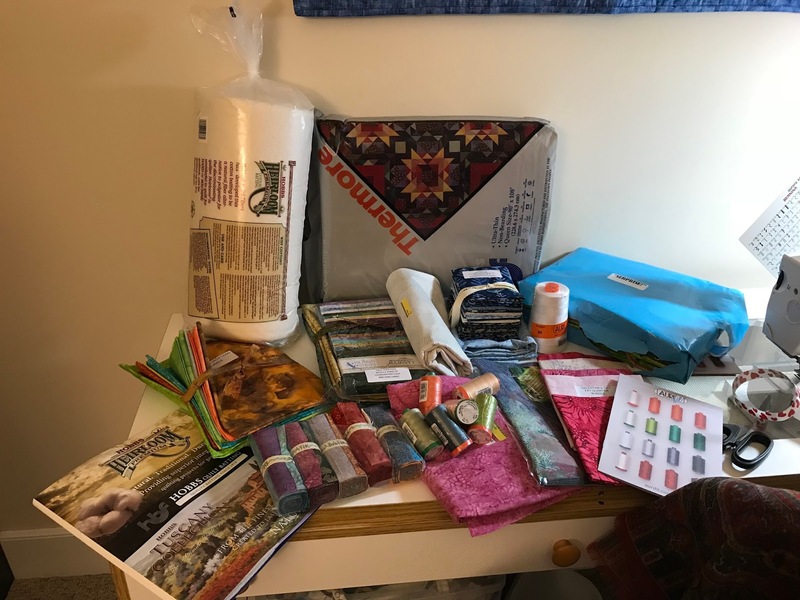 Can't wait to see what you make with it all! It sure is and I am sure it will be 22 pounds worth of fun! See the beauty!! I'n no quilter except with words and ideas hoping to contribute a little color to the divine quilt of the Creator.